The majority of industry experts seem to agree that the signs of a shifting market are undeniable, but there are still others that contest it is just a seasonal shift similar to what the market experiences towards the end of every year. While there are annual trends in the market, the important question is if it is beginning to trend in a new direction - turning almost imperceptibly like a freighter ship. Price reductions are becoming not only more common, but also more substantial as timid home buyers are increasingly sitting on the sidelines in hopes of an impending downturn. Is the real estate market really changing in Santa Cruz County? Only time will tell if the summer’s slowing sales are a temporary pause or the sign of a more permanent change in our market. Over the last six years a nationwide inventory crisis has become one of the biggest worries in the real estate industry. As demand grew, more and more people were vying for too few homes. This imbalance in supply and demand caused major bidding wars and even a dip in home sales. Following years of inventory shortages, rising home prices, and bidding wars, the number of homes for sale may finally be growing. In September, 208 single family homes were listed for sale on the Multiple Listing Service (MLS) in Santa Cruz County. This is a one percent increase year-over-year and a twelve percent decrease from August’s 238 listings. Remember, there is a seasonality to the market. Ever year inventory dips in the fall and winter months so the month-to-month drop isn’t likely something to be overly concerned about. Total listings from January 1st through September 30th are 1.4% higher than they were during the same time period in 2017. This is a small increase, sure, but it is the first increase the local market has seen in three years. We’ve got to start somewhere. Home buyers may be unexpectedly delighted to see more homes listed for sale as housing inventory begins to make a comeback after years of decline and incessant headlines about inventory shortages. September’s almost flat inventory may be an indication of big change ahead. Home prices have been a roller coaster this year. 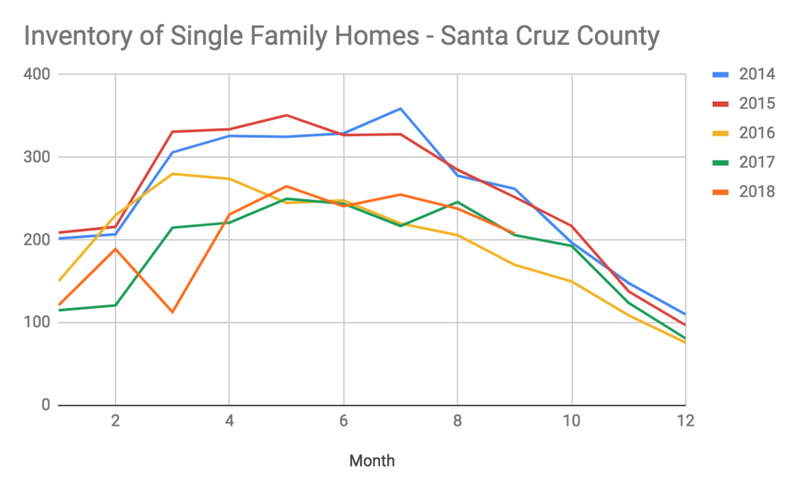 Data from the MLS shows a three percent decline in Santa Cruz County home prices between August and September, from a median of $925,000 to $901,000. However, when compared year-over-year, prices have appreciated six percent from September 2017 when the median sales price for single family homes was $850,000. Additional inventory for sale means that buyers have more options and as a result demand begins to wane and some sellers are starting to get pushback on the prices they are asking for their homes. There are a handful of homes currently on the market across the county that many experienced local Realtors expected to fly off the market, yet weeks and a few price reductions later, are still sitting. Of the 134 homes that closed escrow (sold) in September, 33% of them reduced their asking price before entering into contract. These adjusted prices were three percent lower than the original price on average. At the time this article was written, 49% of the 398 homes actively for sale had reduced their price. What is even more unsettling for sellers is that for the first time since January, homes sold below asking for an average of 99.20% of their asking price (or 0.8% below). Only 39% of the homes that sold in September sold for more than their asking price. If you are a seller in today’s market, one of the worst things you can do is overprice your home. If you have to amend the price it is nearly impossible to recreate the same buzz as when your home first hits the market. Pricing too high (testing the market) can ultimately result in receiving less than market value, below what a seller might have received if the home was priced at market value (or even slightly below) from the very beginning. Considering selling or buying a home soon? Still, many sellers (and perhaps their Realtors who aren’t paying close attention) don’t believe a shift is really happening and are pricing their homes higher than what current Buyer demand will support. Remember, you’re pricing a home based on past sales for a future market. That is no easy feat. Record prices, rising mortgage rates and historically low inventory levels may have finally started to perceptibly crush demand. Homes are selling ten days slower than they did this time last year. Those that sold in September were on the market for an average of 51 days before accepting the offer that closed. Some buyers, specifically first-time millennial home buyers, are getting discouraged and may be temporarily “boycotting” the housing market. As prices rise, so do downpayments, making it more difficult to qualify for a mortgage. Simultaneously, rising interest rates reduce purchasing power as well. Every 0.25% increase in rates can translate to $50,000 to $100,000 less in purchase power. There were 131 closed sales in September, 30% fewer than August and the lowest number of closed sales the Santa Cruz County market has seen since March. The market cools seasonally in the fall, but usually not so dramatically. Buyers are becoming increasingly reluctant to take the plunge as they continue to evaluate whether or not prices may have peaked. This means many would-be buyers are sitting on the sidelines until there is more clarity in the market. No one wants to buy at the top of the market. 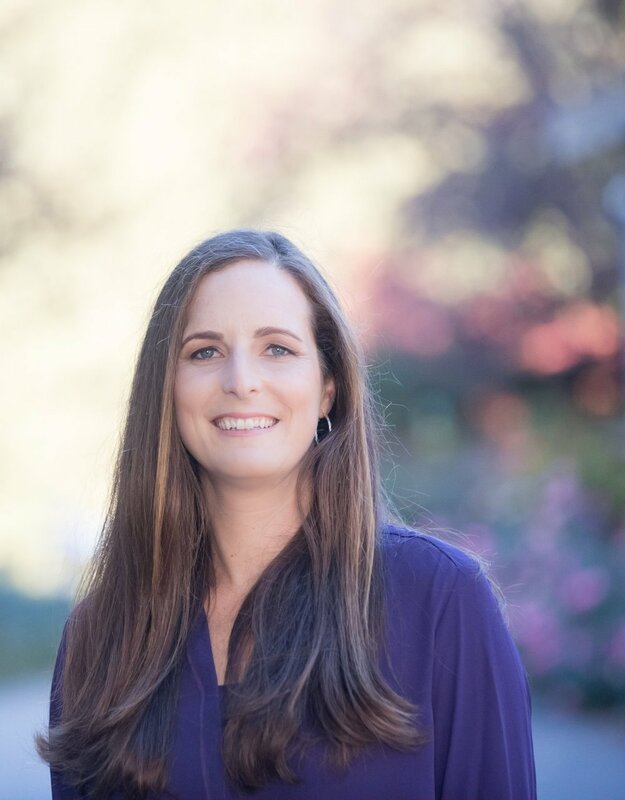 It could be too early to say with certainty if this is a turning point in the Santa Cruz County real estate market or just an adjustment brought on by more significant changes that took place earlier this year. One of those changes has been the 0.5% increase in mortgage rates which has limited affordability for many buyers. Without a correlating rise in wages, the market of buyers is impacted, in turn affecting the volume and price of sales. Another change is that sellers are beginning to see that the days of easy, fast gains could be coming to an end. More homeowners are indicating that it is a good time to sell, which is a healthy cause for a shift in the market. I don’t have a crystal ball, but I wouldn’t count on your home appreciating and being worth much more in the spring than it is now. With these recent changes in the market, homeowners who are thinking of selling should do so sooner rather than later. Selling or Buying in 2018 or 2019? I’m here to help you achieve your real estate goals.